Originally intending on going into environmental law, Frank sought to gain a unique perspective by working on a farm. 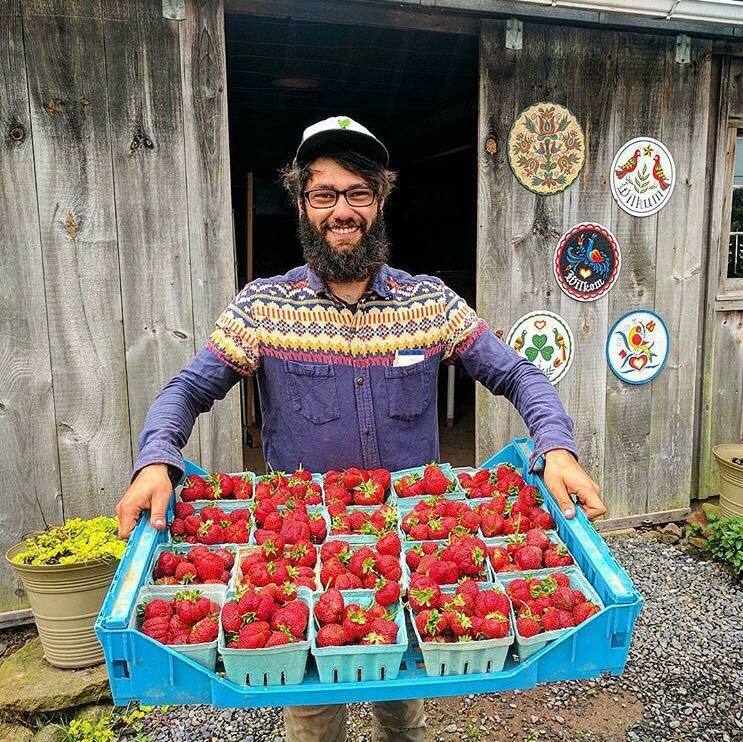 He got his start in farming as an intern at Kimberton CSA in 2012. It was then that he discovered the beauty of organic and biodynamic agriculture, the local food movement, and all of the benefits and possibilities farming had to offer. Realizing his passion aligned more with farming than law he continued that experience at Two Gander Farm in Downingtown, Pennsylvania for three more seasons. As he honed the skills necessary to grow vegetables and manage a CSA, he partnered with Andrew to pick up where they left off at Kimberton CSA. Frank also works as an organizer for the Pennsylvania chapter of the National Young Farmers Coalition. Andrew got his start in farming in 2011 as an intern at Kimberton CSA. He worked for three years under Erik and Birgit Landowne, learning how to operate a biodynamic, mixed vegetable farm. Subsequently, Andrew worked as the Farm Manager at Food Moxie, the non-profit educational arm of Weavers Way Coop in Philadelphia. Andrew is excited to be back at Kimberton CSA and once again working alongside his colleague Frank. He considers the CSA's 10-acre plot his spiritual farming home and is dedicated to producing the wholesome, biodynamic vegetables Kimberton CSA's members are accustomed to. Before he started farming, Andrew and his wife Allison were active CSA members in Louisville, KY. They are both long term advocates of the local food system and the promotion of community food security. Becky started farming at Kimberton CSA in the summer of 2015. Over the next two years she juggled farming with her studies at West Chester University and her part-time job at Kimberton Whole Foods. In 2017, after graduating from WCU with a bachelor degree in Nutrition and Dietetics, she dedicated more of her time to farming, culminating this season as Kimberton CSA’s Field Assistant. She has a passion for the local food movement, farming and nutrition, and hopes to incorporate all three in her future endeavors. Her favorite thing about farming is being able to work outside and grow beautiful biodynamic vegetables for the community where she lives.